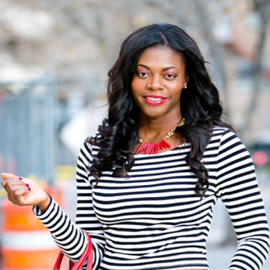 Hello Yvonne: Leather & Stripes! Skirt- ASOS (Similar, Similar), Heels- Christian Louboutin (Here), Top- Zara (Similar), Bag- Michael Kors (Here), Necklace- Mesa Blue Jewelry (Here). Hello, having a good week so far? I hope. I was thinking of how fashion evolves. I vividly remember wearing a red DKNY crop top while in high school over 15 years ago, and 3 yrs ago thinking I'd never wear one again until recently with it trending. But there is a difference of how my crop top was worn over 15 years ago with a lot of midsection exposed, as opposed to now with almost no midsection being visible and paired with a higher waist bottom. Besides adding the high waist leather skirt to balance the proportion of the crop top, I added the black heels and a pop of color with the necklace and bag. I think this look works for valentine's day also with the red pops of red if not wanting to do a pink or red dress or skirt. Happy Valentine's week! Very pretty hunn! Too bad it's a freezer in Toronto right now! I would prolly steal this look! Lol.How is the job going? I am just loving this look, Yvonne. It's very fresh & refined. You look like you could take over the world. I love the MK purse as well as your hair! Thank you so much! I see the temperature posts in Canada and as much as I want a little more snow, I cannot imagine how freezing it is over there.... stay warm! !